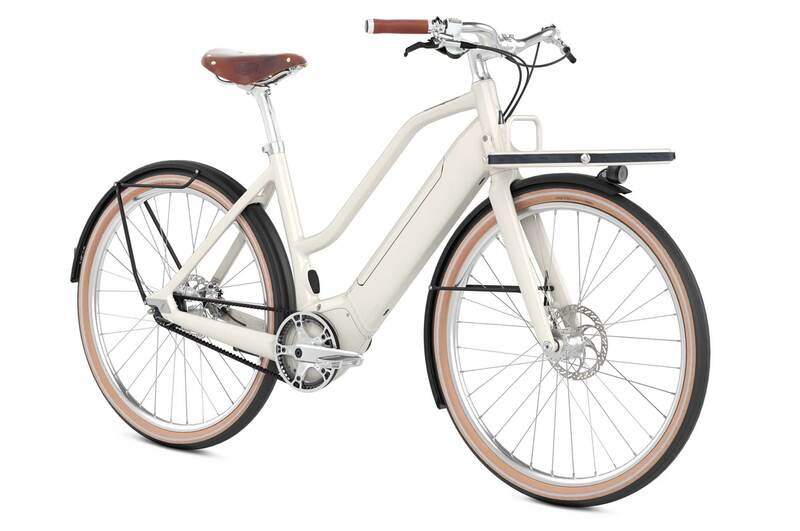 Bold but gentle — Hannah is our women's bike with e-motor, perfect for both city and country riders alike. With Hannah you can transport excess baggage with ease, safe in the knowledge that you will not be stranded with flat batteries. Hannah is designed to make everyday life easier. These include a low-maintenance Gates Carbon Drive CDX belt drive, lasting up to four times longer than a chain, and a proven Bosch e-motor. Years of engineering make these the perfect pair for a virtually maintenance-free bike. The low profile frame is ideal for family cyclists due to the possibility to attach a child seat onto the seat tube and getting on and off the bike comfortably. At the front, baggage can be placed on the rack without the load having an influence on the bike handling. At the rear, Wingee mudguards with an integrated bracket for pannier bags offer further loading capacities. A transport gem in the truest sense — Hannah can freight a load and yet still remain nimble and agile, almost silently threading her way through traffic. Hannah provides a complete package of equipment offering peace of mind. Ready for shipment May 2019, the pre-order is open now. Please note: the photos seen in the gallery below show the model Heinrich in midnight blue. Hannah will have identical components, detailed photos will follow soon. 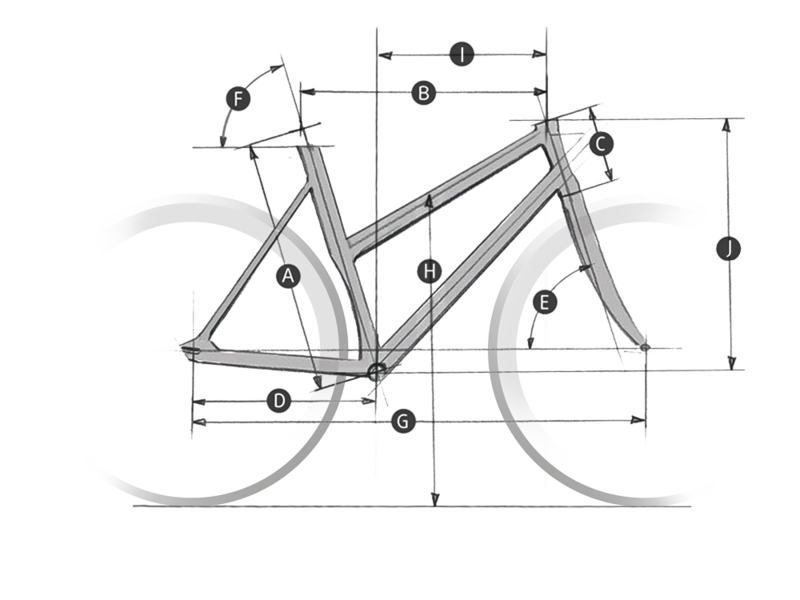 When fitting a drive belt on a bike, you need an ultra-strong frame and rigid rear triangle. Parts and components made from aluminium are both strong and lightweight, making it the ideal material to use when designing rigid bikes. For this reason, at Schindelhauer Bikes we manufacture all our frames with high-quality 6061 aluminium. The forged dropout connects the slider-belt-tensioning-system and our in-house developed SBP (Schindelhauer Belt Port). This means the bike frame is ready to be fitted with the Gates Belt Drive. With our E-Bikes we achieve this stability and stiffness through a multi-cell down tube, a forged motor bridge and large cross-section chain stays. The seat tube has been reworked and can fit a child seat. For the Bosch system, we have developed completely new frames with a very compact motor bridge. Due to the close, optimal integration of the motor we achieved an, inside the E-Bike segment, incomparably short chainstay. This makes for a short wheelbase while still maintaining a comfortable seating position. The top tube is comparably long and the riding feel very agile. While developing the frame we focused on stiffness as well, in order to ensure a rigid, agile feel and a direct transmission. This stiffness is made possible thanks to a multi-cell down tube, in which the removable Bosch PowerTube 500 battery is optimally integrated. Bosch is not without reason the market leader in e-bike drive systems. This includes a reliable run time, high safety standards, a dense service network and the regular and obligatory training of dealer partners. 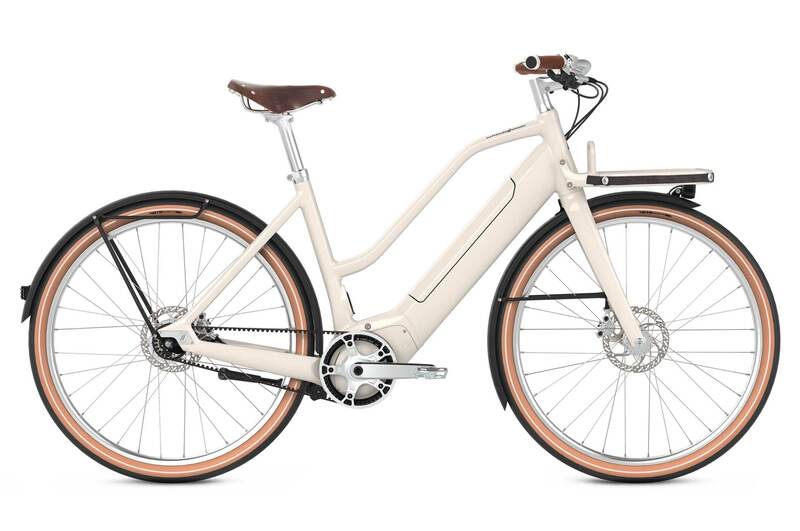 The third generation of Bosch motors impresses with long range and virtually unnoticeable pedalling resistance when the motor is switched off or while riding above 25 km/h. In addition, the Active Line Plus drive unit — without a gearbox — is very quiet. Bosch mid-mounted drive units work reliably even on inclines, as the motor analyses the interaction between the shift, torque and cadence, ensuring optimal efficiency and energy use. The PowerTube 500 battery enables a range which, depending on the motor level, can last for multiple trips to work, shopping or out into nature. The battery is removable and fully charged in 4.5 hours. Bosch batteries have a long service life, are tested to the very highest safety standards and can be charged at any time, regardless of their battery status. Interruptions of the charging process do not damage the batteries. A complete discharge is not necessary. The choice of assistance is made via the handlebar-mounted Bosch Purion display, which can be used to select the four motor levels, from Eco (minimum assistance) to Turbo (maximum assistance), as well as displaying the driving speed. Switching off the motor or turning on the walk assistance is possible via the display unit. The plus and minus buttons are used to change the motor levels intuitively, whilst a long hold on the plus button switches the light on and off. 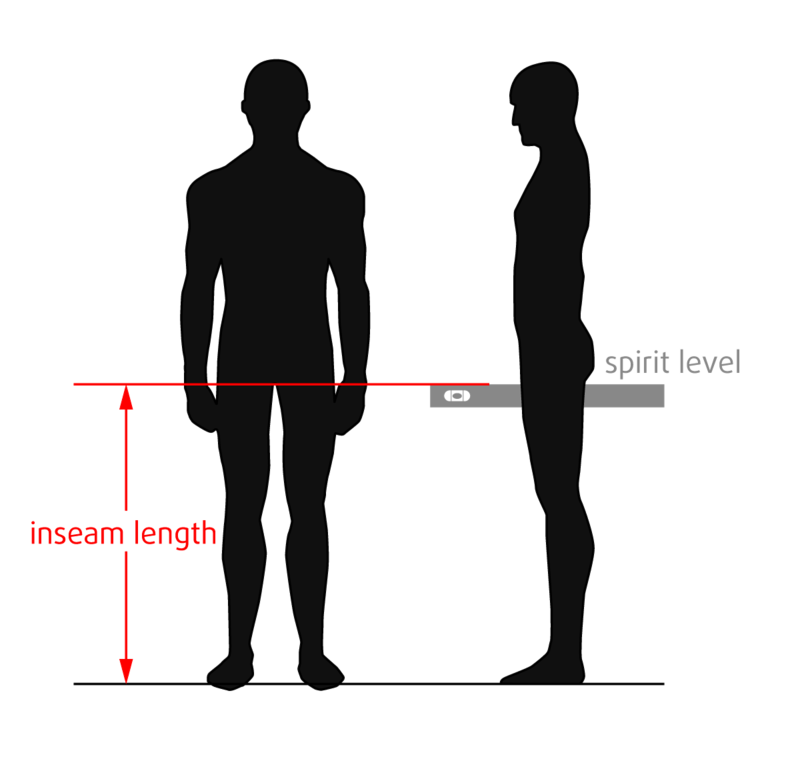 The range depends on several factors and can be determined here by way of example. Decisive factors are the terrain, overall weight (bike and rider) and the starting frequency, e.g. at multiple traffic lights. Leisurely cyclists light on baggage and with few stops can travel an unbeatable range of 200 km per battery charge in Eco mode. If you prefer to travel faster or have more baggage with you, it will still travel 80—120 km before the extra boost of the motor is absent. But even then the onward journey is no problem, because even without e-motor, our Bosch bikes still maintains a natural riding experience. The Mini 2 front light has it all: thanks to the new Terraflux 3 lens, the brightness has been increased to more than 15%. In addition to the optimized reflector it creates an ideal road illumination. The energy is supplied via the e-bike battery. The 8-speed Shimano Alfine hub gear is the proven choice - quiet and with little rolling resistance, it offers the ideal addition to the Bosch drive unit in conjunction with Gates Carbon Drive. Alfine hub gears can be switched quickly and accurately, the ergonomically designed Rapidfire Plus shifter makes switching gears even easier. We find it really handy to be able to carry heavy items on our bikes and so decided to design a front rack that securely attaches to the frame. The rack does not affect steering and Gustav can sail through traffic even with heavier items on board. We have equipped it with the innovative VarioStraps system, which can be adjusted to adapt to the size and shape of whatever you are carrying. When not in use, the straps can be tucked away discreetly on the rack. Wingee manage to walk the line between creating robust, well-designed mudguards, as well as integrating a bracket onto which pannier bags can be attached. Thus a high-quality mudguard-rack-combination with a very minimalistic design was created. The set weighs only 1kg and is solidly made to carry a load of 8kg per side. The Gates Carbon Drive belt is revolutionary in terms of bike power transmission. Requiring zero maintenance, the belt also lasts approximately 3-4 times longer than a chain. What’s more, the belt is super strong and efficient because of the embedded carbon fibres as well as being extremely quiet and incredibly lightweight. Life is also a lot easier when your trousers are still clean after travelling by bike thanks to the absence of oil and grease. Our hydroforming fork, especially designed for our e-bikes, sets a new standard for what is possible with the raw material aluminium. Due to its one-piece-hydroforming-method, a completely hollow fork is created, which is both rigid and lightweight and leaves enough space for internal cable routing. The forged drops, an elegant postmount-brake calliper and Thru-axle system complete this multi featured fork. With its big tyre clearance our hydroforming fork is made for every adventure. We want cyclists to be comfortable and able to explore the city at high speeds. To guarantee both, we opted for the WTB Horizon 650 B. The tyre makes light of cobblestones without the need to reduce pedalling speed. Reflective strips ensure you’re safely seen in the dark and the brown strip on the sides adds a little chic.